I begin by reminding you that one of the blessings of having to go through such a time of testing as God’s seen fit to be putting me through is that you get to spend a lot of time with the Lord. Undoubtedly, this is eventually going to have the effect of seeing some things a little clearer. Sadly, most professing evangelical Christians are under the impression that the church visible, which they often do not distinguish correctly, is in a time of refreshing just prior to some coming awakening. For example, the Future Outpouring “Prophecy” of SBC elder Beth Moore. That’s the foolish belief that supplies the root to the charismaniac compromise of TV Preachers Glowingly Describe Meeting with Pope to Tear Down ‘Walls of Division’, which featured Moore’s mentor James Robison. You need to understand that nothing good will come from it. However, this reversal of the Reformation is going to continue in spite of the tragic death of Robison’s friend Tony Palmer.1 The reason being, mainstream evangelicalism is now full of corrupt Contemplative Spirituality/Mysticism and charismaniacs lusting for peace with the world. And you have the evil influence of the neoliberal cult openly operating within the Emerging Church aka the Emergent Church to thank for that. For years now young evangelicals have been bombarded by EC propaganda telling them they need to be more like the world to reach people. The tragic fact is, nothing could be further from the truth. All this false teaching has now spread throughout the Seeker Driven camp of evangelical megachurches leading to scores of false converts; many who have now grown up and are unconverted men and women standing behind pulpits. It has been well-stated elsewhere that the visible Christian church has its mightiest influence to the direct degree that it stays separate from the given culture, i.e. the world, around it. God will always provide power when the church follows His directive in our opening Scripture. Frankly, church history—and most importantly the Bible—prove this and teaches us not to rely on our own ingenuity. Unfortunately, we live in the middle of a time where church leaders have turned their back on this. Instead, we’re told just the opposite; that we must be like the world. What we need to see right now is a wholesale turning away from evangelical mythology and a return to Scripture. Just think of the devastating consequences of listening to people-pleasing preachers like Joel Osteen and Word Faith king Kenneth Copeland with their compromises. Osteen avoids the Cross while Copeland embraces sinful ecumenicism. I shudder to think of how many people following those fools will die dropping into hell. How sad when all their lives they would have been deluded into thinking they are Christians, but were never regenerated. Never forget that the Cross of Christianity never compromises; in fact, it stands for separation. And remember, in Jesus’ time, a cross killed everyone who was ever placed upon it. It separated all from life and those who were condemned to be crucified knew they had a death sentence. You say, “This message is extreme.” I say, you’re right; it is. You need to realize that Jesus knew this when He said, “whoever does not take his cross and follow me is not worthy of me” (Matthew 10:38). All those who heard Him say this knew exactly what our Lord meant. They understood that the cross was extreme and it was final. No one who carried a cross was spared. As one minister put it, “The genuine message of Christ is a call across a gulf from death to life, from sin to righteousness and from Satan to God.” This is counter to today’s non-gospel. Without preaching the Law and the Cross the unbeliever never gets to see why they’re in such spiritual peril. Being like the world so as to comfort them in their sin keeps them from ever seeing just how amazing the grace of God really is. At best, today’s Christian message cheapens it. I discussed this previously e.g. in Jay Bakker, Homosexuality, and Gospel Reductionism. You really need to come to grips with all of this before you read what is to follow from Martin Luther below There was an old Nazarene preacher who gave some advice to a young minister who was just starting out. Sound wisdom, which the young man never forgot. “Son,” he said, “I sure like the way you preach the Gospel, and I’d like to give you a little bit of advice.” The young minister eagerly told him that he would love to hear anything the more experienced man of God might wish to share. 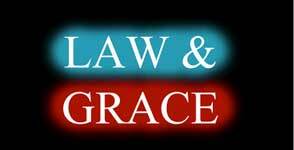 We need to learn how to clearly distinguish the law given through Moses from the grace that came through Christ. We must always keep the role of Christ separate from the role of Moses and make a clear distinction between the two. We need to know precisely what purpose each one fulfills so that we don’t become confused. I was confused about this distinction myself for over thirty years. I just couldn’t believe that Christ wanted to show His kindness to me. The first commandment teaches us that God wants us to sincerely trust him. Yet we also must fear him above everything else. In other words, Christians are like children who have been punished but who still love their father. And they remain confident that their father still loves them. The good works required by the first commandment are far better than wearing special clothes, fasting, praying, and all other the other god works religious people have invented. So the good works required by the first commandment are holy and must be obeyed. But who can live up to them? Certainly no one can completely obey the first commandment. Everyone is a sinner except Christ.